Is a new romance blossoming? John Mayer and Demi Lovato were spotted hanging out at West Hollywood hot spot Catch L.A. on Saturday, October 22, multiple sources exclusively tell Us Weekly. The "Gravity" rocker, 39, and the "Confident" singer, 24, arrived at and exited the rooftop restaurant separately, but appeared to hit it off inside. "John had his arm around Demi and was whispering sweet nothings into her ear," an eyewitness tells Us. "She was into it. They weren&apos;t making out or anything, but she was giggling the whole time." A second insider added that the pair "chatted it up for over an hour," and Mayer gushed that Lovato "has one of the greatest voices." 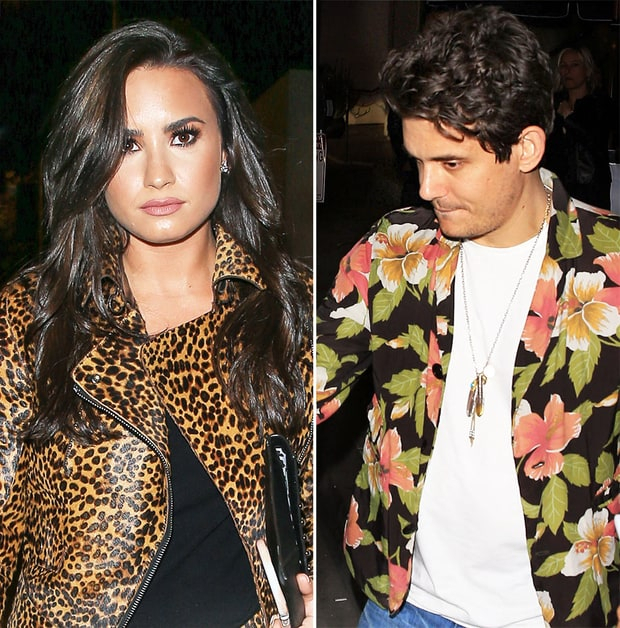 Lovato looked stunning in a black shirt, a leopard-print jacket and a matching miniskirt at the L.A. establishment, while Mayer donned a Hawaiian-print shirt over a white T-shirt and faded blue jeans. This isn&apos;t the first time the musicians have crossed paths over the years. In April 2009, the "Your Body Is a Wonderland" crooner complimented the Disney alum&apos;s song on Twitter. "I have &apos;La La Land&apos; by @ddlovato stuck in my head. Actually, it&apos;s not stuck. I&apos;m choosing to sing it. B section is sophisticated," he wrote at the time. Lovato replied, "That is quite possibly the best compliment I&apos;ve received in this business. Thank you so, so much!" The Twittermance then turned into a full-blown conversation as Mayer wrote, "You&apos;re going to make lots of records, I can tell. Write one song at a time and never, ever apologize for any of them, ever." Later that day, the then-teenager told fans on Twitter that Mayer was her "inspiration" and "idol." A few months later, the Grammy winner and the "Heart Attack" singer-songwriter collaborated on "World of Chances," a song on her second album, Here We Go Again. "John Mayer&apos;s been a huge influence on me. His songwriting really inspires me," Lovato told MTV News in June 2009. "I guess he had heard I was a huge fan, and he sent me a letter. Then we ended up writing together. And it was really great &apos;cause he actually reached out to me, and it was like a dream come true." She continued, "The process of the collaboration was actually really funny because he&apos;s a really, really funny guy, and he talks a lot, so he&apos;ll go off on something. … I had a great time. He taught me a lot about the business and gave me a lot of advice." Mayer previously dated Katy Perry, Jessica Simpson, Taylor Swift and Jennifer Aniston, among numerous other famous faces. Lovato recently ended a relationship with Wilmer Valderrama, and was previously linked to Joe Jonas and Trace Cyrus.